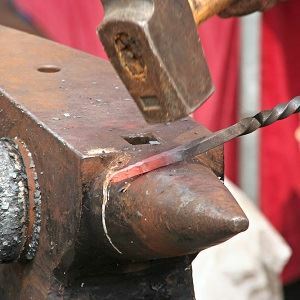 Blacksmithing is heating pieces of wrought iron or steel until the metal becomes soft enough for shaping with hand tools, such as a hammer, anvil and chisel. Heating generally takes place in a forge fueled by propane, natural gas, coal, charcoal, or oil. This Basic Blacksmithing Class is a 2-session class of three hours each. These two three hour hands-on class allow you to learn basic techniques such as drawing, bending, and twisting and then advance to splitting, scrolling, and punching. You will be able to design, complete and take home simple projects such as bracelets, triangles, hooks, spoons, tools and more. The class will include an introduction to heat treating if appropriate for the projects undertaken. Combining processes through forge work. Develop an understanding of traditional tools used in the blacksmithing trade including a forge, hammers, anvil, etc. Participants must wear long sleeve shirts and pants in natural fiber clothing and closed toe shoes of either leather or cotton. Athletic or synthetic shoes and stretch fabrics are prohibited.